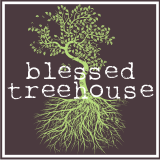 Blessed Treehouse: Reflections of the way life used to be. *Sidenote: I have strong audio memories of that song, Reflections. Seriously, I hear that song and I can see my parents watching China Beach while sitting on the couch. I couldn't tell you the first thing about the show, but I can hear the theme song playing in our living room on Strathburn Court. Anywho, so I looked back at pictures of Mr. Henry from one year ago. One year ago my son could frequently be found eating from the dog's bowl. It was a constant battle. The poor dog was often forced to eat outside because we didn't trust Henry around the dog food. I was constantly correcting Henry. Constantly removing him from the kitchen. Constantly barking at him, Stay away from the dog food. And yet I look at those pictures and I miss it. I miss the dog food battle. I really do. And this reflections of the way life used to be was exactly what I needed today. Last week was one of my hardest weeks as a mom. Two sick kids combined with a little boy who is testing my every last nerve. He is in the tantrum/meltdown stage. He breaks down constantly, for no good reason. All day long. I was exhausted and cranky. Scratch that. I was just plain ugly. Not to mention I'm honoring Lent for the first time in my life, and Satan has been attacking my home big time. But I look at those pictures from a year ago, and I think, One day, I'm going to miss this current battle. I'm going to miss the tantrums. As crazy as that seems to me right now, I know that one day it will not be tantrums but something else weighing me down. Lord, Please help me to embrace today. Now. This moment. With my precious babies. Thank you for giving me these beautiful blessings. And allow me to honor you even when I think, I just can't do this anymore. You and I both know that one day I'll be longing for an almost-two-year-old who throws himself on the floor and flails his body against the hardwood. Love you. Love your kiddos. Pick a day this week. You are one wise woman. Expressing your feelings and then giving the Lord permission to help you! Your children are also blessed to have the perfect Mom chosen for them by the Lord! Reflections and Memories down the road....the blessings of living life with God's help! Thank you all. Motherhood ain't easy, but how do people do it without Jesus?